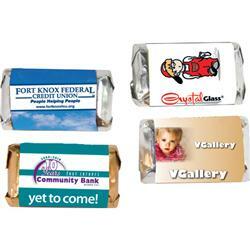 Miniature Hershey Singles with a promotional full color wrapper personalized with your logo. Candy Made in America! Custom wrapped miniature chocolate candy bars. Original Hershey wrappers stay on the bar we wrap with your full color art. Great for any give away program. Don't give them generic - give them Hershey Chocolate. A great retro promotional giveaway. Available Colors: Full Color Wrapper. 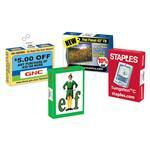 Available Imprint Options: Label printed in full color. Hershey Miniature Chocolate Bars and Candy with a full color label. Made in America.